First of all I would like to state that I’m not an SAP developer. I’m a designer, so I use graphic design programs for my everyday work, and I haven’t seen any program codes yet. The only problem with it is there are lots of things to change in SAP Fiori Theme Designer… but you won’t use it. You can change everything on your UI with Theme Designer what you wouldn’t like to change. I will write every sequence what you can modify in this program, but I promise you’ll use the custom CSS option mostly. Alright, let’s begin. First of all the mostly important, if you make a full unique design for your company is the logo. We use the Netlife logo in this case, but you can use anything what you want. In case you want to look this perfect, then you should use a picture without background (SAP Fiori Theme Designer can handle PNG or GIF file format so you can make it easily), because if you set a unique background to your theme then it may look ugly in case the logo has a background too. In addition next option is background. We can make a background in Photoshop, or any other graphic program, and you can set it as background. I used this size: 1200 x 963 px PNG with low quality save. Yes, we prefer the low quality picture, because it loads more faster and this is very important user experience factor. But the best option is if you set a color, or a gradient as background, because this will the fastest option. And if we use a picure what is smaller then the screen we can set the repeat of this. Switch to turn on/off the repetition of the background image. Chose ‘true’ or ‘false’ as value. We will set every new option to red (#ff0000) to see what change in preview. This is an overlay color if we click on search button for example, and the black or a grey color will be a good choice for it. This will change your icons’ background as like you see on picture below. You can set it as your brand’s main color. We cannot see it on the previous picture, because there’s no border on these. But if you click on for example App Finder then you can see the changes what these option cause to your design: Look at the top Button’s Border. We signed it with red color. This is a small change, but if we set it to the wrong color we can make a big UI mistake. So you should whatch for it! This will change the color of these buttons if we rollover the cursor on it. We presented it on “More” button. You can see the previous option in green color (active search button), and we signed the border with red. This is the sapButton’s dropdown menu text color like on picture. In Preview we see it only at “More” button. This color is used to visualize a ‘Bad’ value. This color is used to visualize a ‘Critical’ value. This color is used to visualize a ‘Good’ value. This color is used to visualize a ‘Neutral’ value. This color is used as a color set in a sequence of 11 chart colors. It has a defined contrast to its predecessor and successor. You can see this change on “Catalog” button’s border. This is the bottom text of the SAP tiles. Readability is an important UI factor, so I recommend to use different shades of grey color on tiles. If you want to use your brand color you should use it on tiles’ icons. This is another useless option. That’s why I think there are lots of item in SAP Fiori Theme Designer what you never use, but theres no other options, what you want to change. So that’s why we must use the Custom CSS codes to change these. The SAP Content section’s icon color is a main item in SAP Fiori Theme Designer, but there is another problem with this program. You can see that I change the color to full red, but icons looks more like a pink color. How is it possible? There are lots of item in SAP Fiori Theme Designer what has an overlay. It’s another layer on an item what may affect the item’s color what your set on it. This feature built by SAP to this program, because they want to add importance, or priority to every single item. So you shouldn’t change every tiles’ items to the same color by design “codex”, but my question is: Why restrict this option me? 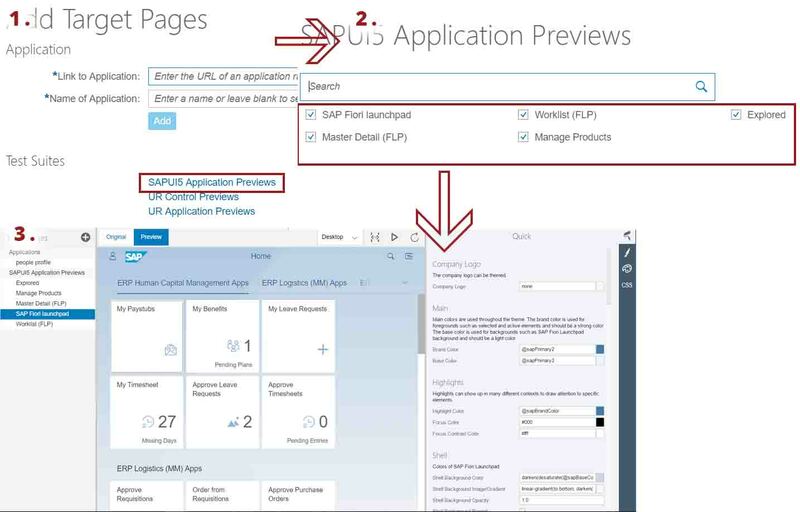 If I started to change the Fiori UI, it is likely I am a UI designer, and I am aware of SAP’s design guideline. But of course you can outfox by set this change in CSS rather. There is another useless option: Shadow color. You should do it better if you set it on black, or maybe some kind of grey. Any other color looks like a lightsaber from Star Wars. Just look at my red color set! You should set the SAP Field Background color to a light color, like a light grey with a darker grey text. For example the background set to #e7e7e7 and the text to #4d4d4d. This option cause changes to the same section like on previous picture, but with hover. If you rollover you mouse to the filter by tags box it change to the color what you set. That’s what I talk about. If you set your search box to a light color, you can change it to a darker color. But of course there is an overlay too, so you should better, if you set this color with Custom CSS too. This option indicated with red color. I think it should be white. This option has an overlay too what cause a darker color than what you set. The following section is the SAP List, what you can see on picture with a red background. The background color of Image Placeholders. The foreground color of Image Placeholders. The color of Marker Texts. If you are not a CSS developer then this part look the scariest. But looks can be deceiving! Follow my instructions, and you will enjoy the endless possibilities what allows by Custom CSS. Click on the right sidebar to the bottom icon: CSS. You get a message, accept it. After is you get a “notepad” where you can write CSS codes. Right click on the element what you want to change (in our example to the “pin” button, because we want to change the background to a lighter color, to separate it from tile). Click on “Inspects element” (Ctrl+Shift+I) and search the same color what you see on your screen. If you not sure this is the element and color what you looking for you can click on checkbock next to this line. If the element disappeard you find it! You can write over the color to another color what you want to use. Is it look good on preview? Great! At that time you find everything what you have to copy and modify. Furthermore sometimes the element color made by background-color not just color. You can set it like my second element what you see on this picture. So finally all in all you can set every color, font, border, hover by this smart supplement. I know it’s maybe more time-consuming like you set it by theme designer, but I think it could be more clear what you want to change. With this option you can fully personalize the SAP Fiori. Blog, Netlife, SAP Fiori design, sap, sap fiori. permalink.